It’s time for another Tuesday’s Tip from a Dream Makers Travel Agency vacation planner! This week Hunter Keeling is giving tips on good ways to avoid crowds at Disney World. Hunter loves to travel to Disney World with her husband and kids, and each year they travel to Disney World to experience Mickey’s Not-So-Scary Halloween Party. In addition to the Halloween party being a favorite for her family, Hunter has a list of some of her other favorite things in Disney World. For instance, her favorite ride is Expedition Everest, her favorite park is Animal Kingdom, and her favorite Disney snack is a Mickey pretzel (Yum!). You can see more of Hunter’s favorites on her page at Dream Makers Travel Agency. Without further ado, here is Hunter’s tip for this week! If you are flexible with travel dates, try traveling during a lower crowd time such as January, February, or September. For more in depth discussion on the best time to travel to Walt Disney World, visit this past tip from Denise, the owner of Dream Makers Travel Agency. Can’t travel during one of those times? No problem, keep reading! Maximize the free perk of FastPass+ that Disney offers! Fast Pass+ is a system that allows you (or your travel agent) to book three rides 60 days in advance when staying on property at a Disney resort. For guests staying off property, FastPasses can be booked 30 days in advance. *Extra tip: try to schedule your first three FastPasses as early in the day as possible, because once you have used the first three you can schedule more one at a time from the My Disney Experience (MDE) app on your phone when you are in the park. You can also find FastPass kiosks located inside the park to make those extra FastPasses. Early bird gets the worm! Arrive to the park early – before rope drop, also known as park opening. Plan to get to the parks 30-60 minutes before rope drop to get through bag checks and security. To pass your time at rope drop, talk to the cast members! They have the best stories. Once the park is open, ride the most popular rides first! The queues will only get longer as the day goes on. Extra what? Extra Magic Hours (EMH) is time in the park before or after regular operating hours, and are yet another FREE perk given by Disney to their resort guests. The Extra Magic Hours are scheduled in advance and are offered in at least one of the four theme parks per day. You can find EMH information on the MDE app or website. Crowds in the parks will peak during the early afternoon hours. 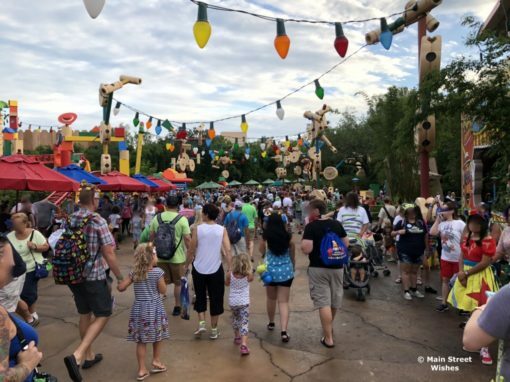 To avoid long lines, heavy crowds, and high temperatures (in the summer months), head back to your resort or Disney Springs until early evening. This is the perfect time to swim, shop, or explore other resorts. *Extra tip: this is a perfect time for a nap for those traveling with babies and toddlers. Experiencing one of those Florida afternoon thunderstorms? Don your poncho and keep having a magical time! Nothing sends guests out of the park faster than rain. Attraction queues will be short during this time, so take full advantage. Get help from the experts! Don’t forget that booking with a travel agent can get you free concierge level planning services such as itineraries. These special, individualized itineraries can help you save even more time in the parks. More time equals more rides, shows, and character meet and greets! Thanks for the tips, Hunter! It’s always good to know how to utilize your time in the parks, so you get to experience more and wait less. To contact Hunter you can find her on the Dream Makers Travel Agency website, on her Facebook page, and on Instagram. We’ll have another tip from another Dream Makers Travel Agency vacation planner next week! Contact Dream Makers Travel Agency today to book your trip and get FREE concierge level planning included with every booking.